Best Dog Whitening Shampoo: Keep Your Westie White! You love your Westie, but its no secret that West Highland White Terriers tend to be a high-maintenance dogs. Their fur can get stains in them that are hard to remove. A good whitening shampoo can help to remove these stubborn stains. 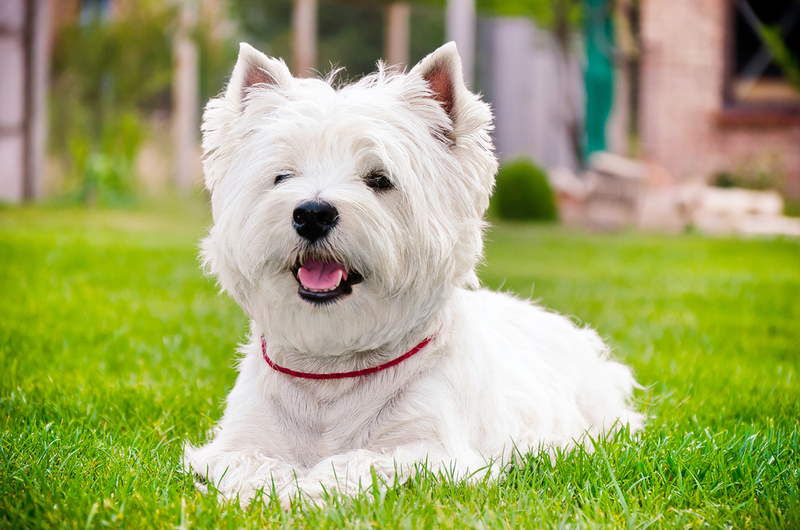 It can be difficult to choose the right one with so many options on the market so this guide will give you information that can help you make the best decision for your Westie. Why Use a Whitening Shampoo? There are a lot of really good shampoos for dogs, but for a Westie’s white fur you will need something a little more “special”. White fur is much like white clothing–it gets dirty fast and it’s hard to get the stains out. Unlike white clothing, Westies can’t take off their fur in dirty situations. While you can go switch out your white shirt with a black one, Fido doesn’t have that option. This is where whitening shampoos come in. Whitening shampoos have different chemical agents such as bluing chemicals, peroxide, etc. and the shampoos are specially formulated to clean white fur. In the event that the fur loses its’ luster, whitening shampoos can restore it to it’s healthy, shiny state. Whitening shampoos also help to prevent yellowing of white fur. The color of your dog’s fur doesn’t necessarily affect it’s health, so you technically could get by with regular dog shampoo. However, this isn’t recommended because certain stains can be unsanitary. For example, your dog’s fur may be yellowed from urine. That’s not a stain that you want lingering on your Westie. Aside from unsanitary stains, whitening shampoos just make your dog look better. A dog with a sharp, crisp, white coat is an amazing sight and this can be especially important if your dog is a show dog. Whitening shampoos can have any number of active chemical agents. They may have one main active chemical or a combination. In general, whitening shampoos can be grouped into categories by their main active chemical agent since each one has a specific purpose or use. The five main categories are bluing shampoo, enzymatic shampoo, clarifying shampoos, bleaching shampoos, and dyeing shampoos. Bluing shampoos are great for increasing the brightness of your Westie’s fur. They do this with optical enhancers that make fur appear white to the human eye. These enhancers fade away yellow/orange/reddish tints and makes your Westie’s fur look more vibrant than ever. Enzymatic shampoos work by dissolving away the particles that cause stains. This type of shampoo may require several applications in order to completely remove the stain. Clarifying shampoos are really good at removing stains and brightening your dog’s fur. They can remove most stains including the ones that are hard to remove like wax, oil, or blood. The downside is that they tend to be harsh on dogs’ skin. This is because these shampoos have a low pH level (around 3 or 4) compared to a dog’s skin (around 6 or 7). These types of shampoos can’t be used too often or you can damage your dog’s skin and fur. Bleaching shampoos can be difficult to use because they are harsh on your dog’s skin and fur. Bleach tends to have a higher pH level than a dog’s skin so this is a part of the reason it can be harsh. However, if you get a good bleaching shampoo, it will probably be specially formulated to work with your dog. You must use a lot of caution with bleaching shampoo so that it doesn’t get into your dog’s eyes and your dog doesn’t swallow it. This is exactly what it sounds like–this shampoo will dye your dog’s fur. Instead of removing the stain it covers it up. This option isn’t as popular for cleaning your dog. It tends to be more of an aesthetic type of choice. It can also be a lot more difficult to use this type of shampoo because there are a lot of steps involved as well as safety concerns. It would be easy if all Westies could just use any shampoo, but this isn’t the case. Dogs have hair and skin conditions just like humans, so you’ll have to consider this when you shop for the best dog whitening shampoo. Here are a few tips that can help you. One of the first things you’ll want to consider is your Westie’s age. Puppies need special puppy shampoo because adult dog shampoo can be too strong for them. Whitening shampoo has harsh chemicals, so you may want to wait until your puppy is a little older to be on the safe side. However, if you absolutely feel the need to use a whitening shampoo while your Westie is a pup, avoid clarifying shampoo and bleaching shampoo as these are the harshest of whitening shampoos. Some dogs may have sensitive skin. Again, some types of whitening shampoos may be a bit too harsh. If your Westie has sensitive skin, try to find a shampoo with as much of natural products as possible. Look for terms ingredients like oatmeal, honey, or aloe because these help to soothe irritated skin. The shampoo could be labelled as “for sensitive skin” and this will make your selection easier. Your Westie may have dry hair and dry skin. In this case, you’ll need something to condition your dog with. Either try to find a whitening shampoo that conditions, or use a good conditioner after you finish shampooing your dog. Peppermint oil and other essential oils can be good if your Westie’s skin is dry and itchy. It doesn’t have too many harsh chemicals and most of the ingredients are natural. 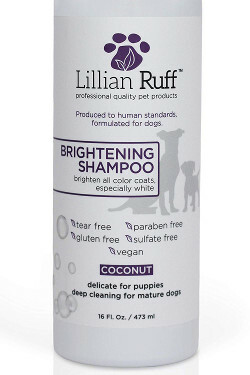 The shampoo has a great coconut scent that will leave your dog smelling fresh. It is a bit on the expensive side compared to other whitening shampoos. Even though it has aloe, it’s only a small amount and can still possibly cause skin irritation, itching, and dandruff. You have to judge this on a case by case basis. It cleans well but it may not get your dog’s fur to a crisp, blinding white color. This may be a problem for show dogs. This whitening shampoo is a really good all-around option for brightening your Westie’s fur and untangling it. It is good for sensitive skin because its gluten-free, paraben-free, sulfate-free, and vegan. It is tear-free and mild, so you can use it for puppies. The largest amount of active ingredient in the shampoo is sodium C14-16 olefin sulfonate, a surfactant. This makes this a clarifying shampoo so you’ll need to be concerned about pH balance with this shampoo. The shampoo contains a small amount of aloe to help with the pH balance issue. This shampoo is manufactured in the USA. Fragrance is the least amount of ingredient in the shampoo, but it stills smell good. This is good because fragrance can sometimes cause irritation even if you have soothing natural ingredients in the shampoo. It is really good at getting out those small tangles that can be close to your Westie’s skin. The manufacturer lists a “proprietary blend” of natural ingredients. This doesn’t give you any indication of what the main ingredients are or how much of each is in the product. Although fragrance is the least ingredient in the shampoo, the smell can still be overpowering and it smells more like a human product than a dog product. This shampoo is interesting because it uses the same ingredients as their human version does. The difference is that this shampoo is pH balanced for your dog’s delicate skin. It contains an all-natural proprietary blend of cleaning agents that brightens your dogs fur and moisturizes your dog’s skin and fur. The shampoo can be used on puppies, but it is recommended that your puppy be at least eight weeks old or older. This shampoo will give your dog’s fur a bit of a sheen that will make his fur look amazing in the sun. 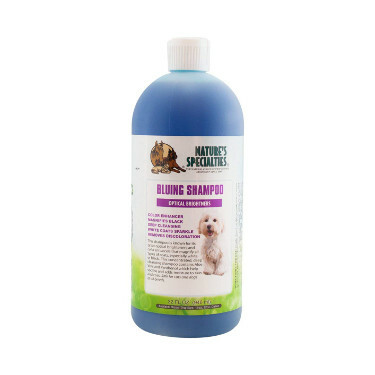 This bluing shampoo can be used on puppies starting as soon as six weeks old. While the smell is horrible, it isn’t good either. If you want something to make your Westie smell pleasant for a while, this isn’t the right shampoo for you. You shouldn’t use this shampoo on your dog’s head or face, meaning that you have to buy a separate shampoo and do a separate washing process. This could get a little tedious, especially if you are under a time constraint. This is a very good quality bluing shampoo from an award-winning company with humble beginnings in California. The optical brighteners in this bluing shampoo work amazingly well, so well in fact that many professionals and parents of competitive dogs opt for this brand of bluing shampoo. The shampoo also contains aloe vera, panthenol, and jojoba oil to help moisturize your Westie’s skin and fur. It’s also great for detangling knots in a dog’s fur. This shampoo is manufactured in the USA in a GMP certified facility. It dramatically cuts down on drying time which is especially good if your Westie hates blow dryers. It is a clarifying shampoo but doesn’t have a lot of soothing ingredients, so there is a possibility that it could be a bit harsh on your Westie’s skin and fur. While it will clean and brighten, it may not get your dog’s fur to a crisp, starch white that you would need for a dog show. This is probably one of the most “approved” or “certified” shampoos on the market. By this, we mean that the facility it’s manufactured in is in the U.S.A. and is GMP-certified. The company is also FDA approved and has EPA certification. If this isn’t enough, the manufacturing facility is solar-powered and the company is dedicated to going green. This product is a great product not just because of the ethics of the company, but because it is a high-quality shampoo that cleans your dog well and brightens his fur. It is a clarifying shampoo that contains a patented Cardoplex System which helps to speed up the washing and drying process. For all of the qualities you get in this shampoo, it’s still in a pretty decent price range. What’s the Best Whitening Shampoo for Westies? The four options we gave you are really good choices. Out of the four, we believe that the Nature’s Specialties Bluing Pet Shampoo is the best. It has the best reviews and the optical brighteners work on a scientific level so you can be sure that it will brighten your dog’s fur. Using the bluing shampoo or any of the others will keep your Westie looking as bright as a snowy day. As long as you take your Westie’s specific needs into consideration (sensitive skin, dry skin or fur, etc. ), using this information can help you choose the best whitening shampoo for fur baby.